In modern fantasy, a paladin is a hero and a knight who fights for virtue and justice, although the term originally went to a notable warrior under King Charlemagne. As it stands, this Paladins armor would be fit for either of these powerful figures. 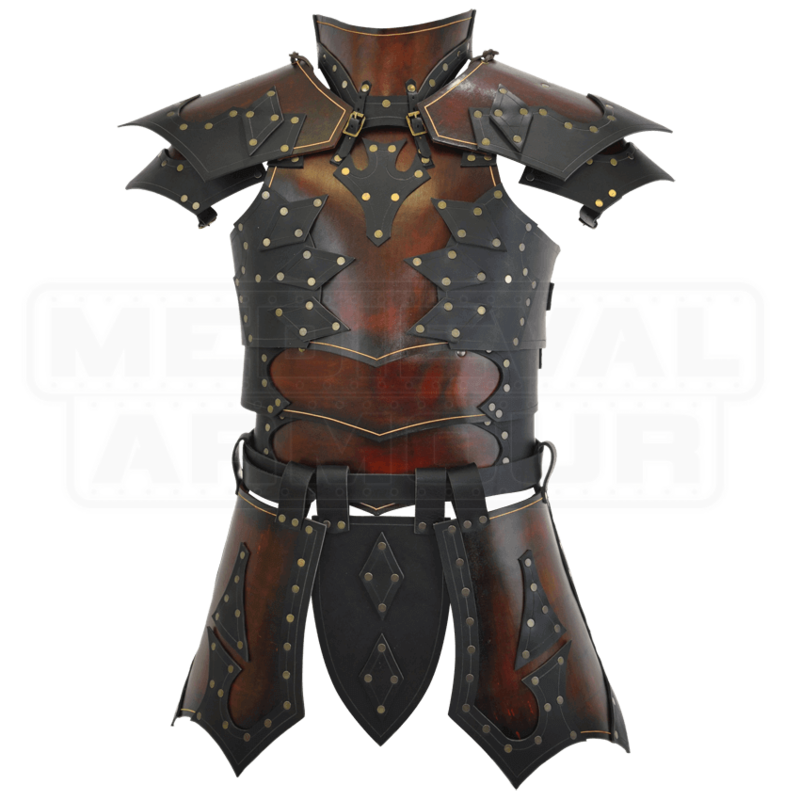 This armor has a dark hue made up of rich brown shades accented with touches of black, creating a regal and impressive look that is fit for any warrior who prefers leathers. This armor is made from layered leather plates. Black accents adorn these leather plates, adding not only an impressive decoration to the armor but also enhancing its protective strength. Included with the Paladins Armor is a neck guard, which extends up from the collar and around the neck, providing extra security to the warriors throat. The neck guard attaches via buckled leather straps in both the front and the back. Also included with the armor is a pair of matched pauldrons. The pauldrons echo the layered look of the armor and are attached via grommets and laces at the shoulder. They also buckle to the arm, so the pauldrons move when the arm does. 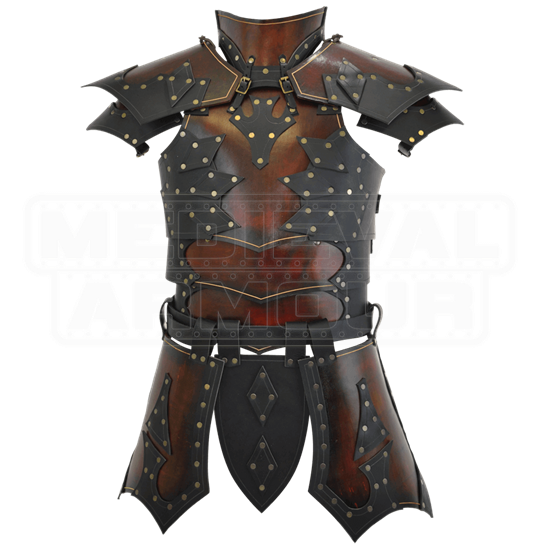 The armor also comes with an adjustable tasset belt, which features one central hanging plate flanked by two longer leather plates. The armor is worn using a trio of leather straps with buckles fastened around the waist and back, ensuring a secure fit. These straps ensure that the armor is highly adjustable too. The Paladins Armor includes the breastplate with neck guard, the pauldrons, and the tasset. Wearing this Paladins Armor will make you look like a formidable warrior, ready to ride off into battle to fight against vicious enemies while in service to your liege and lord or lady.